Beyond the Margin: Alternative Energy: Panacea or Placebo? Alternative Energy: Panacea or Placebo? Skyrocketing global demand and diminishing supply of oil has spawned an energy crisis that threatens economic growth and political stability. In order to secure access to critical energy resources, governments and corporations have sacrificed human rights, negotiated with terrorists, and bribed public officials (e.g. UN Oil for Food Program, Iraq’s invasion of Kuwait, etc.). The true cost of most sources of energy cannot be measured solely in dollar terms, but must also incorporate the environmental impact resulting from pollution, habitat destruction, and geological alteration. A growing movement towards “alternative energy” has emerged as wealthy nations consider the negative externalities of energy consumption as opposed to simply its financial cost. The allure of clean domestically produced energy warms the hearts of environmentalists, but it seems unlikely to pragmatists that a few windmills and solar panels can displace carbon based fuels. 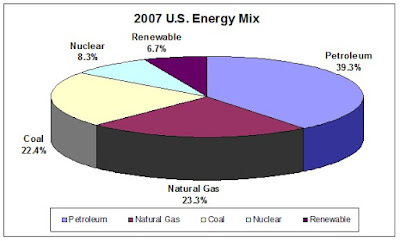 Based on the Energy Information Administration of the U.S. Department of Energy (source), the U.S. derives 85% of its energy from fossil fuels comprised of 39% petroleum, 23% natural gas, and 23% coal. The remaining 15% of domestic energy is split between 8% nuclear and 7% renewable energy. Renewable energy is comprised of 36% hydroelectric power and 53% biomass, which primarily consists of ethanol. The remaining 11% consists of wind, solar, and geothermal power. 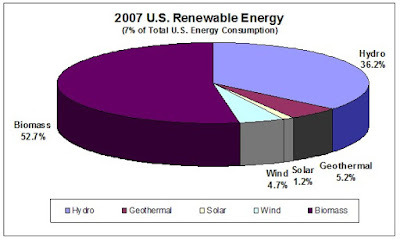 Therefore, less than 0.8% of total U.S. energy consumption is derived from wind, geothermal, and solar. The ability of renewable resources to displace fossil fuels as a meaningful source of energy appears limited. Despite billions in investment, wind power currently contributes less than 1% of the energy consumed in the U.S. While energy consultants suggest that wind power has the potential to contribute 5-7 percent of U.S. energy consumption, the inconsistency of wind and the limited distribution of suitable windy locales expose the structural inferiority of wind compared to fossil fuels as a source of energy. Even less promising, despite similar hype, is solar energy. Concentrating Solar Power, the most productive of solar technologies, requires a large geographic footprint and is only productive during daylight hours. While it holds promise as a supplement to traditional power generation during peak daytime hours, solar power is not capable of displacing fossil fuels due to its relative inefficiency, inability to produce an uninterrupted supply of energy, and extensive real estate requirements for the construction of a meaningful generating facility. While more established than wind or solar, biofuels and hydroelectric energy have well documented consequences to mass production. Hydroelectric energy is capacity constrained due to the limited number of rivers that can be utilized for energy and has devastating side effects on marine life and wetlands ecosystems. Alternatively, biofuels have increased demand for agricultural commodities and the cost of food, spurring greater inflation throughout the economy and transferring wealth from the poor to large industrial farms. Despite decades of research and development, biofuels remain incapable of producing significantly greater energy output than consumed during production and are dependent on government subsidies and protectionism to support their existence. Any expansion of biofuel production starves other industries of essential commodity inputs and encourages a reallocation of agricultural production away from other crops, ultimately triggering dramatic price increases and system-wide inflation. Renewable energy is an essential and growing contributor to the energy portfolio of the U.S. It is not, however, a viable replacement for fossil fuels. Instead of dreaming of a fantastical world of windmills and golden beams of sunshine powering our energy intensive economy, the U.S. would be better served by realistic policies that incorporate a greater percentage of nuclear power combined with domestically produced fossil fuels as a means of achieving energy independence. The wealthy may purchase carbon credits and alternative energy to allay their concerns of a destructive carbon footprint, but pragmatists realize that the global economy will be crippled, with the poor suffering disproportionately, without an expansion of nuclear and fossil fuel energy. Clean coal and nuclear technologies, both with viable long term prospects, are more worthy of government assistance than alternative energy proposals that are incapable of contributing meaningfully to our energy needs. The U.S., representing 25% of global energy demand, must wake up to the reality that an energy policy based solely on conservation and alternative energy is an unrealistic utopian notion that is causing rampant inflation, global economic tension, and personal financial hardship. The longer the problem is ignored, the more dangerous are the consequences.